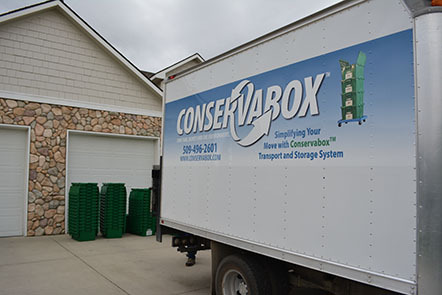 Conservabox® provides you with a convenient, economical, efficient and eco-friendly way to move. Just call to book your date and time. We deliver our Conservaboxes® and dollies to your door along with any packing supplies you wish to purchase. They are ready to un-stack, place on dolly, and pack. When you are done moving, just stack them, they nest when empty, and we come pick them up! Make it simple and organized along with durable protection against crushed or broken contents. Storage for items protecting them from dust and debris. Minimize personal possessions in your home for a better sell. Pack, secure and stack neatly in a small area. Our hanging file boxes make it easy and they can be secured for content privacy. Place conservabox ® on dolly, pack, flip lid shut, place next box on top and repeat. Stack moves easily as you pack with no lifting. Conservaboxes were the best product for moving. We didn’t have to buy boxes, tape them and get rid of them. Easy delivery of the boxes and pick up. Best feature was the movers loved the boxes. They were really fast to haul and stack, which saved us money. We will recommend them to all our friends. Delivery of Conservaboxes®, dollies and supplies to your door. Simple to use, place Conservabox® on dolly, pack and place the next Conservabox® on top, making it easy to move the stack as you pack. Lids flip open and shut to add or remove items. No un-taping and re-taping boxes. Sturdy and can be stacked without crushing valuable contents. Uniform in size, they stack more efficiently in vehicles taking up less room resulting in less trips and carbon emissions. You or your movers can move your belongings and valuables easily, reducing moving costs. Conservaboxes® can be labeled for inventory making it easy to find items needed during and after the moving process. Contents can be secured with Conservabox® closures to prevent content tampering. You will know if Conservaboxes® have been opened in the moving process. Our closures help to ensure security and content privacy, you will know if contents have been removed, gone through or tampered with. Coding helps make sure contents from different offices or areas are delivered to the right location and not to the office down the hall. 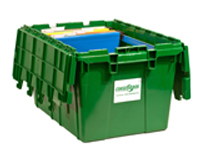 Besides our regular Conservaboxes® for your office move, we also have Conservaboxes® that are made especially to accommodate hanging letter size files. Using our convenient and efficient system helps your business get the job done quickly with less cost. 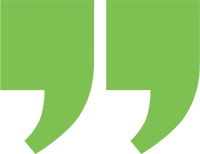 Besides all of this, choosing an eco-friendly alternative for your move reflects well on you and your company. Business or Office to Office moves can be made easily, whether it is across the hall or to a new location, we can simplify it. Using our rental Conservaboxes® , helps keep an organized and neat office setting while you are in the moving process and trying to conduct business. They are ready to unstack, place on dolly, flip open and pack. They can be moved easily from area to area and stack neatly. Our boxes can be labeled, making it easy to inventory, locate, add and remove files or items that you may need in the process. Just flip lid open, remove the item and flip the lid shut. No un-taping and re-taping of boxes. Packaging needs for Distribution, Storage and Shipping. 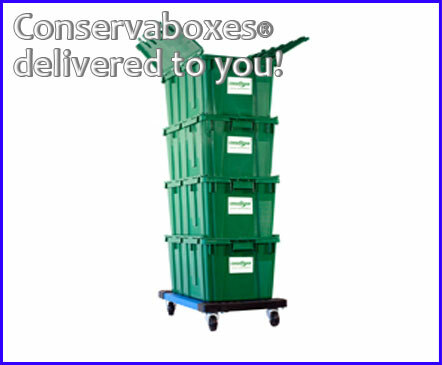 Just place your order, we deliver our Conservaboxes®, Dollies and any supplies that you have ordered to your door, you move, and then we come and pick up them up. It’s that easy! What is your Delivery and Pick Up Area? How long do I get to keep the Conservaboxes®? Conservabox® rents Equipment in 1 week time periods. If you need to keep the Equipment longer it is generally no problem as long as we have the Equipment available and you have called us 24 hours prior to the Pick Up Date. When you call we can let you know what the additional rent will be. Extended rental periods will be based on either our daily or weekly rate depending on how much longer you need the Equipment. What if I am done with the Equipment before my Pick Up Date? If you finish with the Equipment and would like it removed before your scheduled Pick Up date we will make every effort to accommodate you. Just give us a call! We do not prorate the rental period if you finish before the scheduled Pick Up date. How do I know when the Conservaboxes® will be Delivered and Picked Up? When you place your Order with us, we will ask you what day you would like them Delivered and Picked Up on. We will then set up a time block that consists of two hours and they will be Delivered or Picked Up in this time period. This allows you to know when to be available for Delivery and Pick Up without having to wait around all day. Does someone need to be available for Delivery and Pick Up? Yes, you or someone that you have authorized to sign for you needs to be available to accept and sign for Delivery and Pick Up during your time block. Authorized signers must be 18 years or older. It is important that you or the authorized signer is available during this time block, so that the driver does not have to try and Redeliver or Re-Pick Up as there are additional charges for this. Also, additional rent may apply if Equipment is kept beyond original Pick Up date. Will you Deliver up stairs? No, we deliver to your door at ground floor locations. If there is an elevator, at our discretion we can decide whether or not to use it. If we deliver above the ground floor, additional charges will apply. What happens if the Equipment gets damaged, lost, stolen or we don’t return all Equipment? You will be charged a replacement fee for each item that is damaged, lost, stolen or not returned. This will be charged to your credit card that you have provided to us. If we come to Pick Up the Equipment and either it or you are not there, and we have had no communication within 24 hours after the original Pick Up Time to extend your Rental period, we will assume that it is your intention to keep the Equipment and your credit card will be charged accordingly for replacement fees and unauthorized extended rent. What if I decide not to move the Conservaboxes® myself and I hire movers? This is fine. Movers love the ease and stacking ability of Conservaboxes®. Just remember it is your responsibility and liability for Equipment rented and or sold to you concerning its security, care and use by yourself and/or others during your Rental Term. If Equipment is damaged, lost or stolen you will be charged a replacement fee for each item. You will need to collect for any damages from the movers yourself. What happens if I need more Conservaboxes® than I ordered? We will be more than happy to deliver more to you. Additional Rent and Delivery fees will apply. 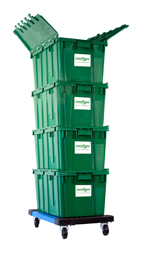 If you decide that you need more at the time of Delivery we may have additional Conservaboxes® with us. If we do, only additional rent will apply. Do you have packing supplies? Yes, for an additional purchase we have Wrapping Paper, Bubble Wrap, Tissue and Geami available. Conservabox® closures are also available for purchase, these work great for content privacy and inventory. We deliver any supplies purchased along with your Conservaboxes®. No more wasting time and the expense of driving from place to place to purchase new cardboard boxes or to hunt for enough used boxes for your move. Eliminate the stress of locating supplies like wrapping paper, bubble wrap, tissue and labels. Conservaboxes® are delivered to your door along with any supplies you wish to purchase. No struggling with folding and expensive tape to build your boxes. Conservaboxes® are ready to go. Just unstack, flip the attached lid open, pack and flip the lid shut. It’s that easy. No excessive lifting and re-lifting of packed boxes. Conservabox® makes your move even easier with our dollies. Just place your first Conservabox® on the dolly, as soon as you’re done packing it, close it up and place the next Conservabox® on top and repeat. Need to move your stack? Just wheel it from room to room, no lifting! Move your stack as you pack! No more crushed cardboard boxes with damaged contents. 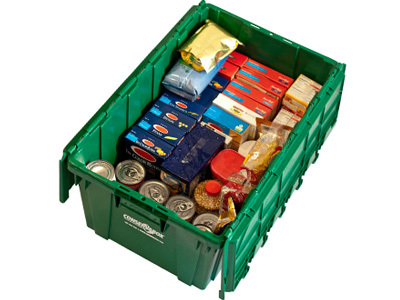 Conservaboxes® are sturdy and can be stacked, helping to prevent damaged contents. No wasted space caused by random size cardboard boxes. Conservaboxes® are uniform in size and neatly stack when full, helping to keep your home or business organized and neat looking during your moving process. They also take up less room in moving vehicles, resulting in fewer trips and lower expenses passed on to you. No worries about how to inventory, protect contents against tampering or ensure privacy of items. Conservabox® has labels to inventory boxes and closures are available for purchase to help ensure content security and privacy. You’ll know if any of your Conservaboxes® have been opened during the moving process. No disassembling of cardboard boxes. Just stack Conservaboxes® when you are done unpacking, they conveniently nest when empty, saving space. No disposing of cardboard boxes after their first or second use. 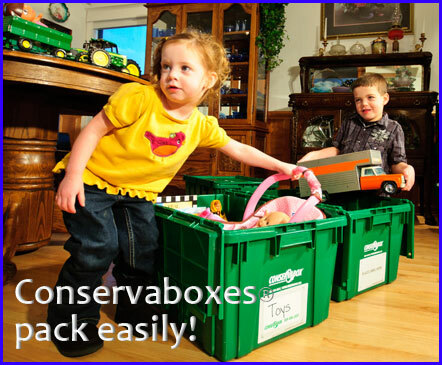 We pick up our Conservaboxes® when you are done. Our Conservaboxes® are eco-friendly boxes that can be used again and again. Helping to save the environment one box at a time. 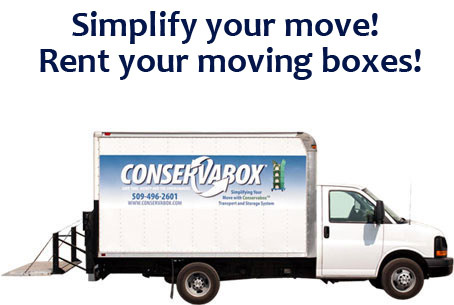 Conservabox® makes your move as simple as possible for you. saving you Time, Money and the Environment. convenient, economical, efficient and eco-friendly way to move. Let Conservabox® take the stress out of your move by delivering our Conservaboxes® to your door along with any packing supplies that you wish to purchase. They are ready to use, just unstack, place on a dolly and pack them. Our dollies make moving your Conservaboxes® easy. They can be moved from room to room as you pack with little effort. No need to keep re-lifting the same box over and over. Conservabox® has supplies available for wrapping as well; paper, tissue, bubble wrap and even an eco-friendly, biodegradable wrapping alternative. Our labels and closures allow for inventory control and coding. Whether you move yourself or hire movers, our system saves time and money. Being uniform in size, Conservaboxes® stack more efficiently in vehicles, taking up less room, resulting in less trips and carbon emissions that impact our environment. Your belongings can be moved easily and in less time. Conservabox® is currently serving Spokane, WA and the outlying areas. Moving from the mainland in the Spokane, WA area to the Big Island of Hawaii? Conservaboxes® love the Big Island and are ready to go. You pack, move and we will pick them up. Conservaboxes® are a great storage solution while your home or office is under construction or during that remodeling project. They help to keep your contents out of the way and protected from dust and debris. Let Conservabox® help you with your business or corporate move. We will work with you to help make your move as efficient as possible. Conservabox® has products and supplies that are designed for business moves. If you need a custom product or supplies we will do our best to find what you need. Our Conservabox® system will reduce the time it takes to get your business back to a productive, working environment. Do you need to ship an item that needs extra protection to help prevent breakage? 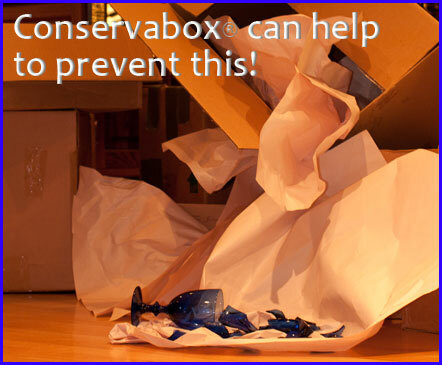 Conservaboxes® are a great solution! Conservabox® can also help businesses with their Re-usable Transport Packaging needs for Distribution, Storage and Shipping. Give us a call to discuss your needs. 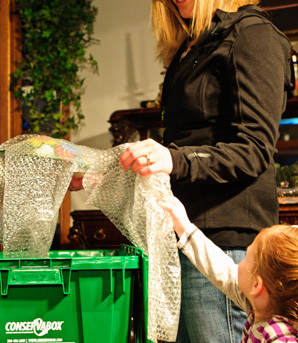 Using Conservabox® not only saves time, money and stress, it helps to save the environment. Conservabox® was started with the idea of giving customers a simpler and more efficient way to handle their moves. Moving is a stress filled time even under the best of circumstances. We realize how busy everyone is now and how important your time is to you, your work and your family. It seems like none of us has enough time in a day to accomplish all that we would like to. We hope that by making our system available to you, it will make a difference in your day. Taking away some of the stress in your move and giving you back some of your time, with the added benefit of waste prevention to help protect our environment. 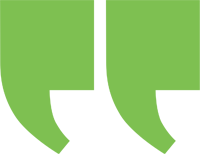 We are a trust worthy company that you and your family can rely on and feel safe using. Simplifying your move for you! When you place your order, book Conservaboxes® for more than 1 week and get 50% off of additional weeks. 10% Senior Discount on Conservaboxes® available for those 60 years of age and older. Delivery/Pick Up Fees are not included in the above pricing. Fees are based on Your Delivery and Pick Up Area, starting at $25.00. Conservaboxes® , Dollies and Hand Trucks rent in 1 week rental terms. Sorry, we do not prorate rents if you finish with the Equipment before your rental period ends. Need more time after your order is delivered? As long as you call us 24 hours before your Pick Up Day and we have the Equipment available, extending your rental term is not a problem. Conservaboxes® are simple to use. Lids flip open and shut. Use with our closures for added security. Best of all they are durable and can be used over and over. Holds up to 60lbs of content. Conservabox® has various closures for added security and inventory control. Conservabox® can help to take the stress out of your move and simplify the process for you. Using Conservaboxes® is an efficient way to make your move and at the same time lessen the environmental impact by using an eco-friendly product rather than cardboard boxes. Thank you again for all of your help during our recent move! We are grateful for your services and how much more efficient our packing efforts were because of Conservabox. We loved the way the totes stacked in each other when empty – such a great space saver before we started to fill them. We also loved how well they stacked up on top of each other once filled. The movers couldn’t say enough about how easy they were to load onto a dolly and then onto the truck. They especially liked how they were all the same size, again making the packing of the truck much more streamlined. Thank you, too, for your helpful suggestions in regard to the packing materials we might need. The perforated bubble wrap was our favorite and I’m pleased to report that not one single item was broken during our move. I think that also really speaks to the durability of the totes and how well fragile items were protected. The boxes turned out to be an even bigger blessing when we wound up moving on a day that saw rain/snow/sleet/hail, etc. The plastic totes were quick and easy to wipe off and there were no issues setting them on the wet ground as we staged what was being loaded next. To be honest, we hope that we won’t be moving again for a long, long time. But if we do, we wouldn’t have to think twice about using Conservabox again! Your company is a win win for the planet and your customers. Conservabox was easy to use and money well spent. I was grateful not to have to waste time running around to stores to buy boxes and tape. During our recent office move, among everything we needed to move was two large very full lateral file cabinets that needed to come with us. The thought of having to unpack the cabinets, build boxes, haul the heavy contents in flimsy cardboard, reorganize and repack the cabinets, then breakdown and recycle the cardboard was a little daunting. But the Conservaboxes were convenient and sturdy. The small ones have an optional railing to hang files, keeping the contents neat and organized. They stacked easily and were simple to move. I appreciated that they were delivered on time and picked up after our move as agreed upon. I had enough time to manage through the move, it was nice not to worry about the boxes. I would certainly choose to use this service again in the future. When I saw an article about Conservabox, I thought it was a good idea. Then, when I found myself in the position of moving to a new residence, I thought of your business. Thank you for working with me and making it financially doable. The convenience of the boxes answers the time constraints of working people. The cost saved me money on cardboard boxes – buying and discarding them. Your delivery and pickup system is outstandingly convenient. 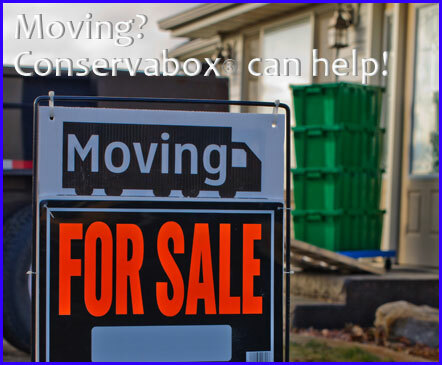 We will recommend Conservabox to anyone thinking about a move. The boxes are sturdy, perfectly sized, well priced and best of all convenient. It was wonderful to have them delivered and even better to have them taken away when our move was finished. 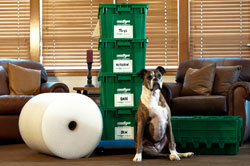 The owners were easy to work with and great to offer moving and packing supplies. Everyone knows moving is awful, I’m glad I used Conservabox to make our move a little nicer. Something went wrong, please click the back button and try again! You answered the anti-spam question incorrectly! Please click the back button and try again!